A dump truck bomb damaged a bridge on the main road north of Ramadi, Iraq. WAPO has more here. A dump truck laden with explosives detonated on a bridge over the Euphrates River on Sunday, the latest in a series of attacks targeting Iraq's bridge network. 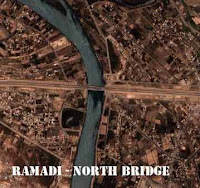 The 3 p.m. suicide bombing damaged a large section of the bridge, which is along the main road north of Ramadi in the western province of Anbar. Two civilians were injured and evacuated to a hospital, according to U.S. military officials. Thats 3 bridges just recently, al-Sarafiya bridge in Baghdad, and the Sarha bridge just north of Baghdad in early June.